The next monarch was the boy-king Tutankhaten, presumably a son of Akhenaten by his secondary wife Kiya. The Old Testament writings have been “sealed,” so to speak, over centuries by a Hebrew tradition for meticulous accuracy in preserving the Scriptures. Because of the ambiguous, and often erroneous nature of the information upon which Egyptian chronology must be calculated, it is not possible to present a full list of Egyptian dynasties and dates. The Egyptians often referred to “wretched Kush” in their inscriptions, and they had made frequent forays into their country, but the Nubians had the last laugh. On the assumption that Dynasties 21 to 25 were consecutive, early scholars dated them approximately 1070-665 B.C., but a number of recent scholars have challenged this assumption. Mernpetah only reigned for ten years, during which time he built his own mortuary temple, and left a stela in it recording his military activities. If he wasn’t the greatest of the pharaohs, he certainly thought he was. Having fathered over 50 sons and probably a similar number of daughters, we would have to concede to his claim for greatness. 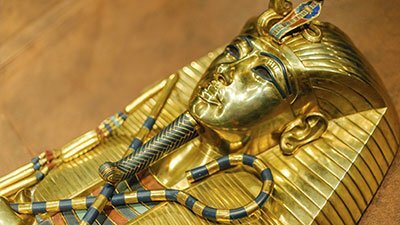 Tutankhamen died childless with no heir to the throne, and what happened next is open to question. Akhenaten’s statues depict him as rather grotesque with an elongated head, thick lips, pinched cheeks, protruding abdomen, and thick thighs. According to one dreamer, Amenhotep III got off to a good start. He was of divine origin. Thutmosis IV was out hunting and fell asleep in the shadow of the Sphinx which appeared to him in a dream. Amenhotep aspired to follow in his father’s military footsteps, and early acquired skill with his bow and arrow, and in racing his war chariot. Thutmosis III did not take long to assert his authority and swing into military action. Thutmosis III was only about 12 years of age when his father, Thutmosis II, died, so Hatshepsut assumed the role of regent on his behalf. A dynasty is supposed to consist of a line of monarchs from the same family, but Manetho, who first divided Egyptian kings into dynasties, did not seem to know about this. It was inevitable that sooner or later there would be a war of liberation, and it came at the end of the 17th Dynasty. It is hard to say who were most confused—the kings who took over after Dynasty 12 ended or the historians trying to sort them out. The texts of Sesostris III reveal him as a strong-minded character who burned the crops of his enemies. The course of history in ancient Egypt has not been fully elucidated. Usually it has to be reconstructed from circumstantial evidence. Before dealing with the Middle Kingdom it is necessary to discuss the sources of information on which our knowledge of this era is derived. To the northeast of the massive Step Pyramid of Saqqara is the mastaba of Mereruka, vizier of King Teti of the 6th Dynasty. Instead of layers of cut stone, the core consisted of a jumbled heap of stones piled up in the shape of a pyramid and then faced with limestone blocks. Menkaure was the last great pyramid-building pharaoh at Giza; however, his tomb is the smallest of the Giza pyramids.